One of our richest Finishing Sérums. Replumping and revitalising, Sérum Yall~O2 will increase and restructure the fullness of the epidermis and lips whilst forming a protective film over the skin. 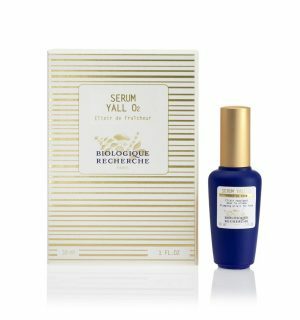 Containing hyaluronic acid and marine collagen, this serum will also fight against dehydration and ageing by reducing the size and depth of lines and wrinkles. Ideal for dehydrated or alipidic, mature Skin Instants®. Antioxidiant and protective agent: Pomegranate Extract. Regenerating and healing agents: Hibiscus and Lily Extracts. Hydrating agents: Hyaluronic Acid, 10% Marine Collagen, Natural Moisturising Factors (NMF). Oxygenating agent: Specific BR Oxygenating Complex, Nanotechnology formulation.